A world-renowned string quartet has been quietly living in the Creative Arts Building, teaching music to students for more than 25 years. 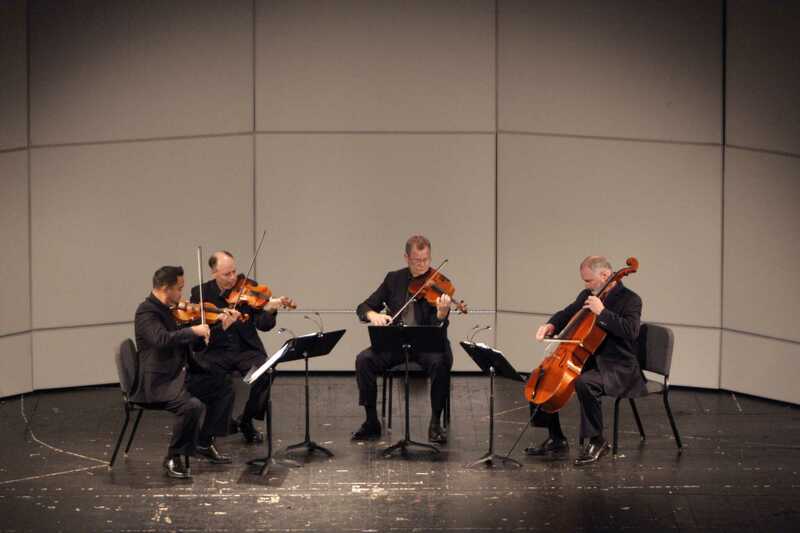 The Alexander String Quartet kicked off the opening day of the Morrison Artists Series’ admission-free concerts at SF State. Established in 1955, the founder of the series, Edward Hohfeld, believed that chamber music could be made accessible to everyone and that the love of music could be instilled in new generations, according to the quartet’s website. The quartet is composed of four members: Zakarias Grafilo, Frederick Lifsitz, Paul Yarbrough and Sandy Wilson. Serving as an ensemble in-residence for San Francisco performances, they hope to teach students by expanding their music into other disciplines according to Lifsitz, the group’s second violinist. The Alexander String Quartet, starting from the left: Zakarias Grafilo on the violin, Frederick Lifsitz on the second violin, Paul Yarbrough on the viola and Sandy Wilson on the cello, perform at the Mckenna Theatre during the Liberal & Creative Arts Opening Day Festival at SF State in San Francisco, Calif., on Sunday, Sept. 28, 2014. Daniel Rivera / Xpress. “It’s amazing to see the response from students listening to this music live in their classroom and to discuss with them the relevance and parallels with what they are focusing on in a particular class,” Lifsitz said. Richard Festinger, a professor at the University and composer of classical music, organized the Morrison Artists Series and introduced the quartet to a packed audience last Sunday, Sept. 28. He has been colleagues with the quartet since their inception in 1989. According to San Francisco Performances President Ruth Felt, the quartet’s residency at SF State is so strikingly innovative that Chamber Music America cites it as a model to be emulated throughout the United States. The quartet played musical pieces ranging from Beethoven, Mozart and Dmitri Shostakovich in the Creative Arts Building’s McKenna Theatre. Associate Dean of Research and Performances and costume designer Todd Roehrman wore a lively white and red pinstripe suit to the event and addressed attendants with a big smile. “The quartet has been a point of pride in the University for a number of years,” Roehrman said. He stated that they offer private instruction toward string students and are important to the school of music as lecturers. He added that SF State is second to none in the Bay Area for their arts programs because the departments coincide with one another. Lisftiz acts as an ambassador for the University and has traveled both nationally and internationally, accumulating over a million air miles since arriving at SF State, according to him. College of Liberal and Creative Arts open their doors for student showcase.